With two vintage motorcycles on the roof, a metal sign and an unmarked door, you might mistake Guzzi’s for either an antique shop or a seedy hangout. But the mysterious joint on the corner of 200 East and 800 South is, in fact, a restaurant—one of the better burger joints in the city, at that. Inside Guzzi’s, you’ll find a vintage look, five barstools, three small tables and a very welcoming feel from those working behind the counter. They’re enthusiastic about the food they serve, and their excitement is contagious. It’s the kind of place that the boys from American Pickers could stop at for lunch after antiques hunting. The menu is small, with five burger choices: Guzzi’s, bacon, flyin’ Hawaiian, pastrami and veggie. If you go with the bacon burger, you’ll be delighted to find that the bacon is cooked with the beef patty, not separately, and the two meaty flavors meld together perfectly. With some grilled onions, tomatoes and lettuce, all between a delicious, soft bun, all you’ll need is some fries. The fries are fresh-cut, crispy and unlike anything I’ve tasted in a while. If the bacon burger isn’t calling to you, try the pastrami burger, with juicy, spiced pastrami stacked tall. My friend said that this was the best burger he has ever had—and he has eaten a lot of burgers. 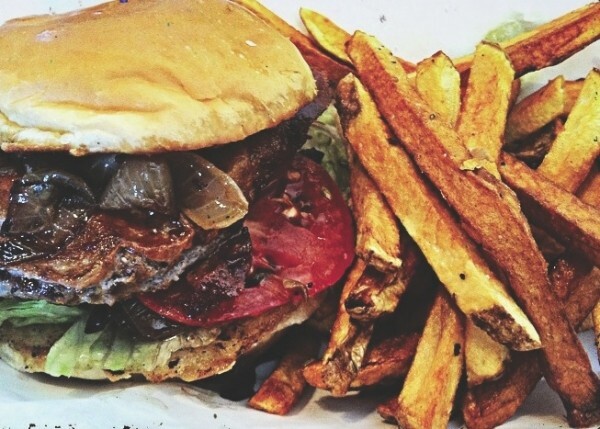 Ordering a burger, fries and a drink might sound like a cliché, but at Guzzi’s it’s anything but boring. And this whole adventure will cost you less than $10—likely much cheaper than any antique.